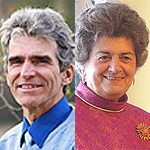 Monday, 6pm EST, Sept. 5, 2011: Due to the Labor Day Holiday, the radio station is closed, so last Monday’s show with Gilles Hainault, musical director of the Vera Choir and IDEAL, and the founder & director of IDEAL, Natacha Kolesar, discussing the healing and transformation that occurs through music, will be re-aired. You will also hear examples of the Vera Choir’s singing. Tuesday, 10:30pm EST, Sept. 6, 2011: This evening’s guest is time-cycles scholar, David Katzmire. David made some fascinating discoveries about the nature of cycles while analyzing stock data for predictive purposes. This led to the formation of Kala-Rhythms, a system of understanding cycles from intellectual, emotional, physical and spiritual points of view that has uncanny accuracy in predicting outcomes and something of the nature of events due to what are the predominating and criss-crossing cycles at a given moment in time.David primarily premiered his work publicly through A Better World TV and Radio. Tune in for this lively dialogue between Mitchell and David, who are long-time colleagues and friends. Listen to the Radio show live at www.abetterworld.net. Archived here too. Watch the TV shows in Manhattan every Tuesday at 10:30PM EST on ch.57 (RCN: ch.84 / Fios: ch.35). Are you outside Manhattan? TV shows are web-simulcast right here at www.abetterworld.net. Player is on home page. Ironic as it may be, most Americans don’t pause for a moment on Labor Day or at any time over the weekend to reflect on the reason this day exists as a holiday. Most people are just happy not to go to work on Labor Day Monday. Labor Day started in 1894 as a result of the Pullman Strike in Illinois, wherein worker’s wages were cut and George Pullman, owner of the company, refused to sit down to meet with the labor union. Eventually, President Grover Cleveland sent the U.S. military in to break up the strike, saying that the strike was a violation of anti-trust laws and was keeping U.S. mail from being delivered. 13 strikers were killed based upon intervention of the U.S. military. Shortly thereafter, likely to help stay the deep upset about those killed and injured, Congress hurriedly passed a law making the first Monday of every September an official holiday called “Labor Day”. What we unfortunately see is that there has been a pattern of use of the U.S. military against Americans that goes back in time. We also see the favoring of big business over labor. By no means am I asserting here that labor is always in the right with its demands, but its right to speak and demand must be protected, a right no longer held sacred as we can see in current legislation across the U.S. And it needs to be pointed out that the disparity in wages between white and blue-collar jobs is enormous and leads to ill-content. A way of bridging this disparity while keeping wages reasonable must be found and mediation activated between the parties as a routine practice. After months of research, SANE Vax Inc. has discovered a substance many government health and safety agencies classify as a bio-hazard, contaminating Gardasil.™ SANE Vax Inc. contracted with an independent lab to test for contamination and found HPV recombinant DNA (rDNA) in 100% of the samples tested. The 13 Gardasil vials, with different lot numbers were from New Zealand, Australia, Spain, Poland, France, and three states in the U.S. All contaminating recombinant HPV DNA was firmly attached to the aluminum adjuvant in the vaccine. SANE Vax Inc. has notified the FDA of their findings via certified letter mailed on August 29. On September 5 & 6, SANE Vax Inc., press releases will be distributed to media outlets worldwide. Due to the sensitive nature of this topic, the SANE Vax team is requesting that any information disclosed be held in strictest confidence until Monday, September 5 when SANE Vax Inc. will issue its first formal press release. Click here to hear Mitchell’s interview on A Better World Radio on PRN, August 11, 2010 on vaccinations and Gardasil. It was a valuable time out of the city for the last couple of weeks for me. Most of it I spent at the IDEAL community in Jaffray, British Columbia, getting some writing done and participating in their daily activities, which I’ve written about over the last few weeks. It’s a special place which is evolving into, God willing, a template for communities of the future. For more, go to: www.idealsociety.org. A Better World is growing. Our weekly Newsletter is getting spread throughout the globe, daily and weekly, people are hearing about us and signing up to receive it. More and more people are visiting the site, listening to the radio shows both at our site and at PRN. More people are also reading my Huffington Post articles as well as those posted on PRN (www.prncomm.net) and Natural News (www.naturalnews.com). Along this way, more people are visiting and “liking” our Facebook A Better World and Mitchell Rabin pages where we post the Newsletter and announce what will be the subjects of the week’s radio and TV shows. As a result of this growth, we could use a few more interns for administration, IT, sales, radio/TV production, managing events, and video editing/production. If you have skills or interest in any of these areas and would like to participate at A Better World for even a few hours a week, send your resume and cover letter expressing your interest to publicity@abetterworld.net. We look forward to hearing from you. There are opportunities in some positions for income. A Better World now has a very affordable arrangement for those who seek to promote their events, workshops, lectures, concerts, films and the like. We have a large list of like-minded people who appreciate the kinds of offerings we have been making available for decades and who hold deep, humanitarian, ecologically-aware, spiritual values that want to see the world evolve into a new, harmonious and wonderful culture and planet. 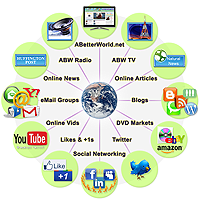 If you’d like to promote your event, concert, film etc., contact us at: publicity@abetterworld.net for information. When people drink IN Extreme Energy Complex to amp up the bio-electricity of their cells in the morning, they feel better all day. When they take Maxodin to keep their brain and nervous system working harmoniously and coherently their mental clarity, memory and health begin to change. I just returned from meeting with the CEO of Ignite Naturals, who is in the midst of a launch of a new, all-organic product, which will take the market by storm. Get in on the action and start the cellular detoxification and inflammation reduction that can lead to disease and premature aging in your body today.